Although I have lived elsewhere on the east coast, I have always called central Pennsylvania home. In 1999 I earned a degree in Environmental Practice and Policy from Juniata College and my first job out of college was as a Licensing Coordinator for Kleinschmidt Associates. In doing so, I assisted our project managers in working with utilities to file cooperative licensing agreements with the Federal Energy Regulatory Commission. I worked on several hydroelectric projects in the mid-Atlantic region and Alabama gathering data, presenting it to stakeholders and assisting with the licensing agreement creation. After that I worked as a Watershed Circuit Rider for Canaan Valley Institute. As a Circuit Rider I traveled throughout Appalachia helping grass-roots environmental groups build their capacity and become fiscally sustainable. Before joining Penn State, I worked for the Southern Alleghenies Planning and Development Commission as an Energy Coordinator. In that position I helped municipalities reduce their energy consumption and as a result lower their annual energy costs. My education and variety of professional experience has provided me with a broad overview of how policy decisions made at the top level affect those on the ground. In my free time I like to travel. My love for experiencing other cultures is the result of a semester spent in Kerala, India during my undergraduate days. While there, I completed 18 credits of coursework, including Indian environmental law and Bharatanatyam dance. Since then I have been fortunate enough to visit many places, but I still have a lot of destinations on my bucket list! 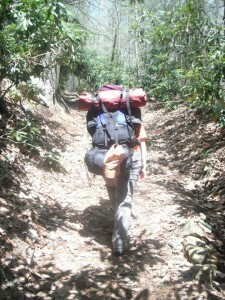 In the mean time I have been hiking and backpacking in as much as possible in the United States. I also kayak, ski, hunt, fish, and love to cook whenever I can find the time.